Chevy has a long established history of creating cars that not only looked fantastic but proved durable and let us face it, classic Chevy cars turned and still turn people’s heads. I want all classic Chevy fans to join me as I travel down memory lane in giving these classic cars their due. Do you remember the 67 Camaro? This car was Chevy’s answer to the Ford Mustang. The engine in the SS model was 350 V-8 that produced three-hundred horsepower. The car lasted through five generations of design upgrades. Sadly, production ceased in 2002 but was reintroduced to Chevy fans in 2010 and was awarded the Design of the Year Award. The Z28 was produced and designed for racing enthusiasts and competed in the Trans-Am series. One vehicle that still turns heads to all who see it is the El Camino. Originally, this car was viewed as a small SUV (small utility vehicle). No one ever thought this car would join the ranks of “Muscle Cars.” What made this car so unique is that back in 1966 the 396 engine was offered which was also available with the Chevelle. The Super Sport Edition was equipped with a Turbo Hydra-Matic Transmission and a 350 V-8 that allowed this Muscle Car to run the quarter mile in 14 seconds. One vehicle that fought hard to park beside the Classic Muscle Cars is the Chevy Nova. This car was not known for fashion but rather was known for its compact form, speed and light-weight. The design that was given to the Nova was originally planned for what was called The Chevy II. The 64 models contained a V-8 engine that was 195 horsepower, 2-barrel 283. If you grew up in the fifties, you might not remember the Bel Air. Why is this you might be wondering? The answer proves straightforward, the Bel Air was not as popular as Chevy imagined or hoped in the fifties. Popularity gained for this car in the sixties with the help of the Beach Boys hit “409”. The Chevy 150 is remembered specifically for the number in the title. The numerical designation originated from the production series number which was also utilized in Chevy’s company reports. Production of this car ceased in 1957 and was replaced with the Delray. The 150 is not as valuable for collectors in comparison to its relatives the Bel Air and Two-Ten models. On a positive note, 150s that contain a V-8 engine are popular with hot rod collectors and enthusiasts because of the lower prices and curb weight. The topic of COPO came up in a recent discussion about muscle cars the other day. For the record, COPO is an acronym that stands for “central office production order”. This term was used frequently during the muscle car era in flagging vehicles that could be ordered directly from the factory. I will officially announce that the recent COPO I viewed was sparsely equipped with no rear seats and did not have air conditioning. If you are racing enthusiasts, you will enjoy the racing bucket seats in the recent versions of these cars. If you are seeking to obtain a Muscle Car while saving some of your hard-earned cash, you should consider the Biscayne. The reason collectors are not beating the doors down for this model is because it has always lacked luxurious interiors and exteriors. You can find these models significantly lower in price in comparison to the mid-line Impala. If you enjoy four-door sedans, the Chevy Deluxe was introduced to the world in 1941. The following year, they offered a fastback two-door “aero sedan.” The production of this model was delayed because of War World II. Chevy stopped regular production of these models and instead focused on producing sedans and coupes for military usage. 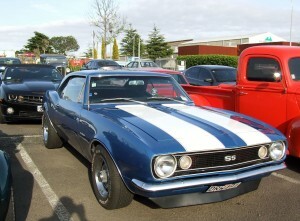 Classic Chevy fans can all agree that Muscle Cars are sights to behold. We all have our memories of these cars and no matter how Ford wants to try; they will never be able to hold a candle to Chevy’s finest, no matter how hard they try.